Brian Farrell and Jason Rubin are cautiously optimistic about the future of THQ's assets. 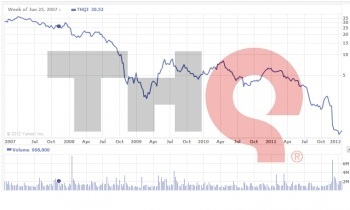 The THQ auction saw many of its assets bought, either as entire studios or as individual properties; the grand total value of the auction is reported to be $100 million. In the wake of this sale, THQ's Brian Farrell and Jason Rubin have been talking about the auction, and the future of THQ's former assets. "While we had hoped that the restructuring process would allow the company to remain intact," said former CEO Farrell, "I am heartened that the majority of our studios and games will continue under new ownership." He went on to say that he regretted that some of his former employees are now looking for work, notably the Vigil Games team. He'll be meeting with affected staff over the next few days, to discuss what happens next. Rubin, the President who said in the most recent earnings call that he had been brought in too late to have much of an impact on development, was also pleased to see that many of the company's talented people still had jobs. He echoed Farrell's cautious optimism for the future of THQ's former assets. "When we first announced the sale process," Rubin concluded, "I said I would be happy if the company's games and people had a bright future, even if it meant I did not have a job at the end of it. And I still feel that way." The $100 million sales figure comes courtesy of Distressed Debt, which has been following the THQ bankruptcy. Relic Entertainment, bought by Sega, was the top seller at $26 million. Some properties - including Vigil Games and the Darksiders franchise - remain unsold.